Hi guys! I'm hopping today with the lovely ladies of Poppystamps, but today there's a twist! 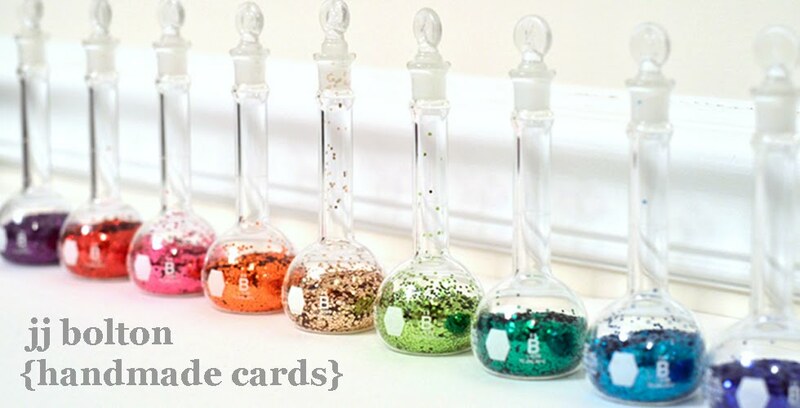 (You're on track if you just popped in from Jinny Newlin's blog!) 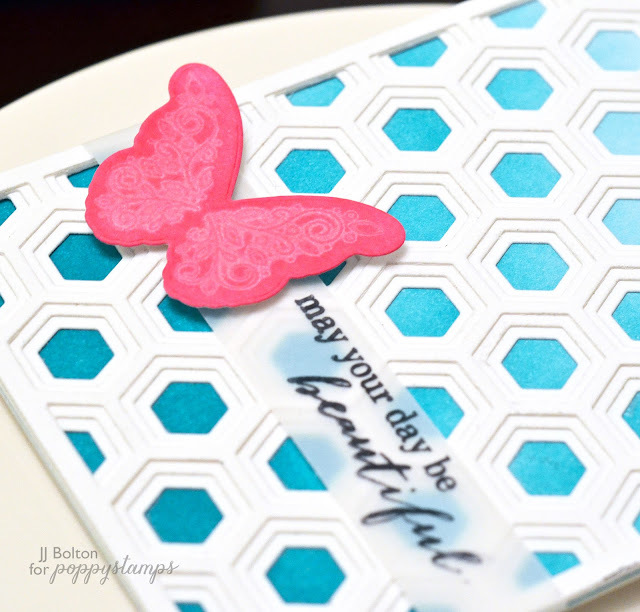 Today we're pairing up our wonderful Poppystamps stamps and dies with Birch Press Design dies! Have you seen the Birch Press Design stackable dies? They are AMAZING!!!! I wanted to create a clean and simple card, so I used the layers in just white to create lots of texture. The white design looks so neat over the ombre-colored background! I didn't want it to get too busy, so I stamped my sentiment on a strip of vellum and then added my die cut butterfly (from Ornamental Butterflies). 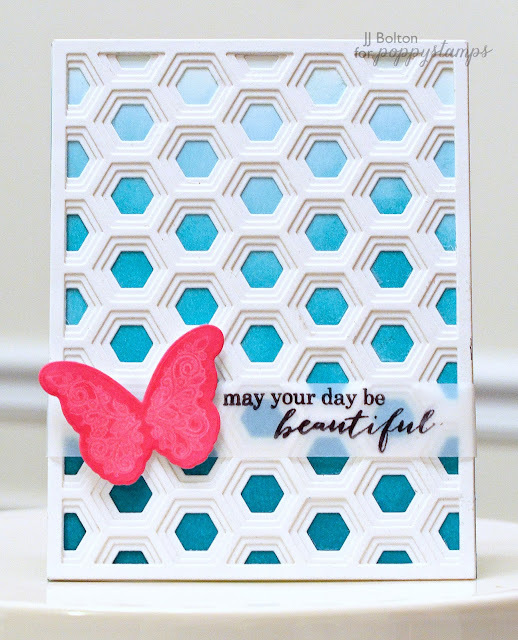 To create the butterfly, I actually blended Distress Ink over the die cut and then stamped it with the scroll stamp using just water! I dabbed with a paper towel and what I got was a delicate lacy pattern. The next stop on the hop is the wonderful Lezlye Lauterbach! And don't forget, one lucky hopper will win a $25 gift certificate! Hoppers have until 12 am US EST on August 27th to leave a comment for a chance to win. 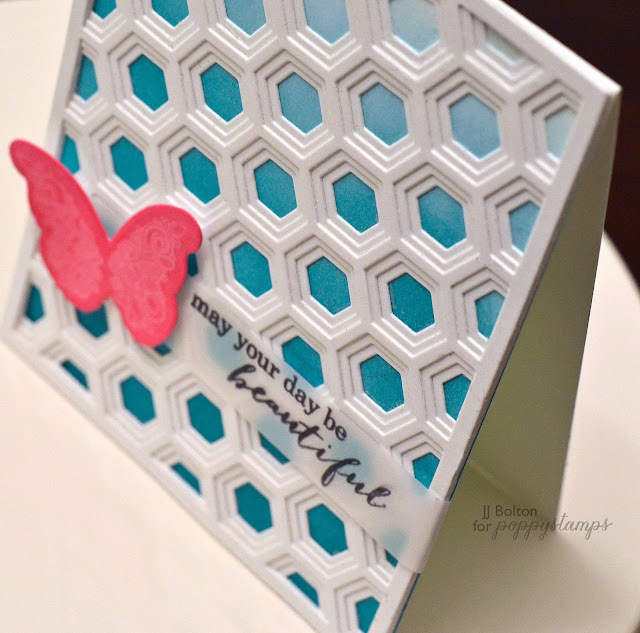 The winner will be announced on the Poppystamps blog on August 29th. We want you to know we think you're all winners - so we're offering FREE SHIPPING (USA only) on all die orders from Birch Press Design. What a great time to try out these new dies! You can see all the layered dies here. Poppystamps.com is having a special sale for you too! 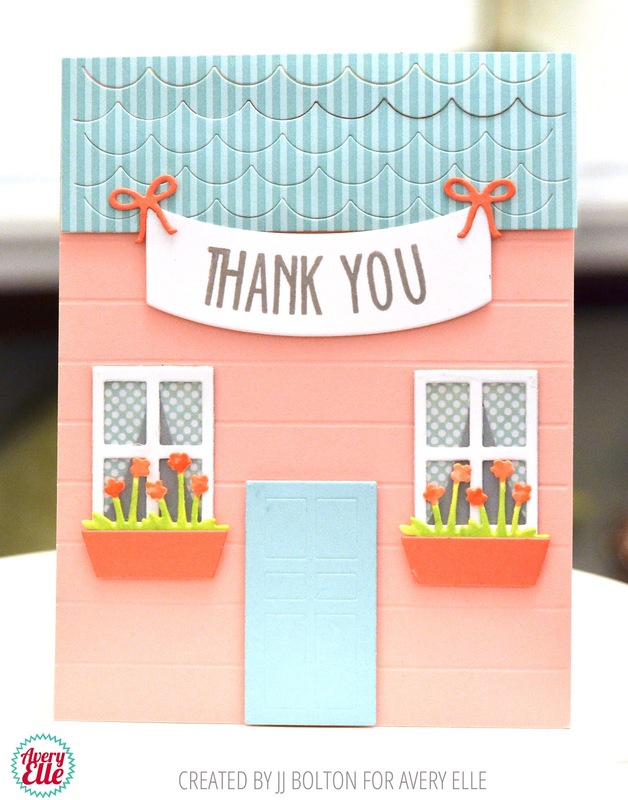 You can also enter the code "FRESH" at Poppystamps for an additional 20% items already on sale (go to SUMMER SALE page to see the great deals)! Click here to go shopping! 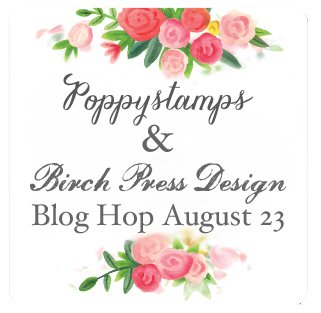 As a bonus, free shipping on Poppystamps orders from August 23 - 28! You haven't lost your way if you came from Laurel Beard's blog! 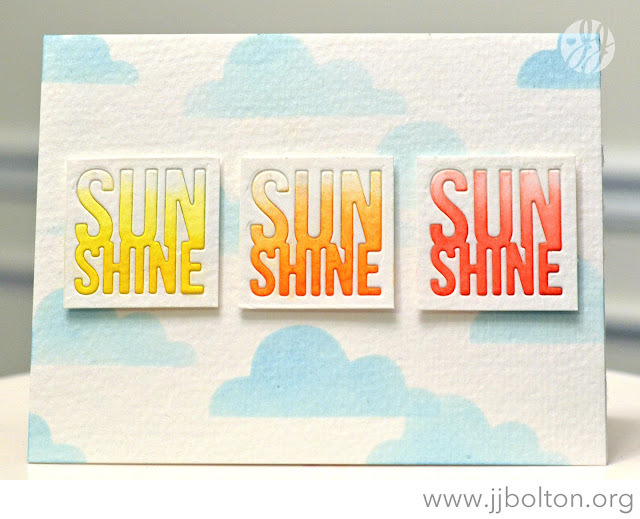 My first card uses one of the 2 dies in the Sunshine Word die set by the ever-awesome Julie Ebersole:) These little dies are so cute! 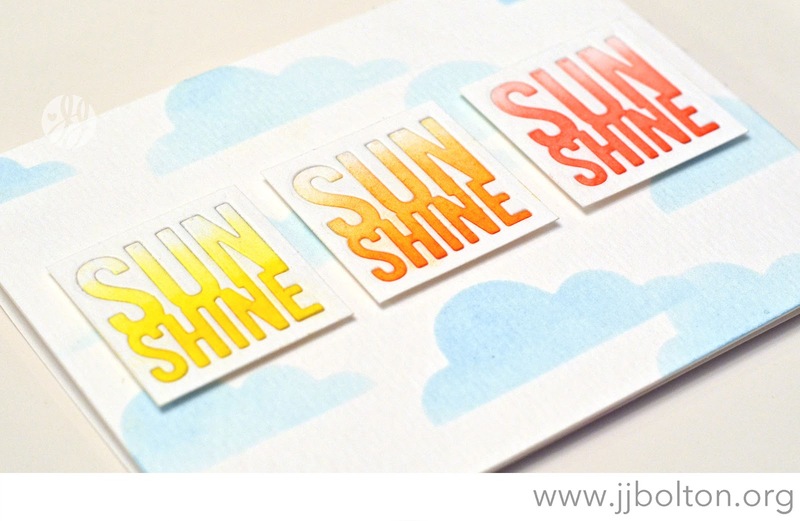 Using an inlaid die cut technique, I created little "sunshine" squares. Because the letters in this die are all hooked together, it's super easy to do the inlaid technique. For the background, I made a mask using the cloud dies from the Silver Linings die set and created some lightly blended clouds. This next card uses the new Stay Salty stamp set and matching dies. 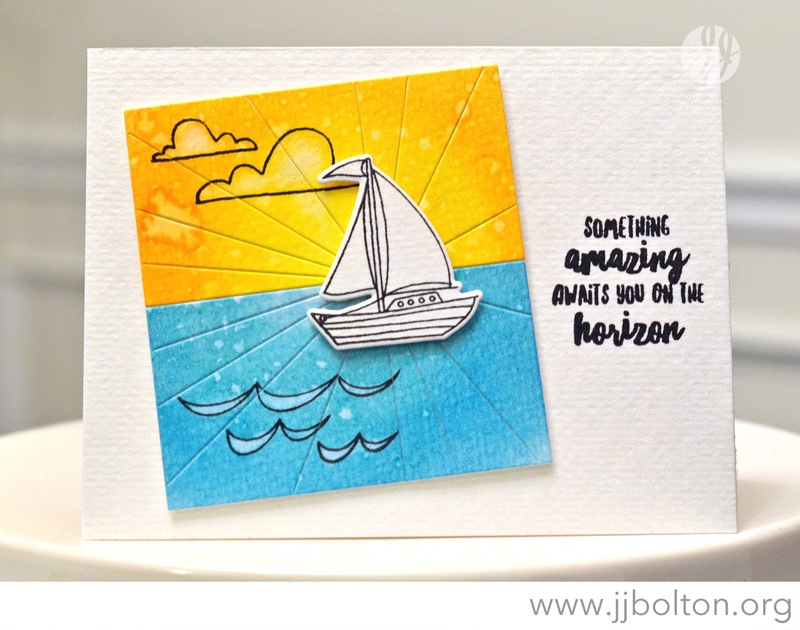 These sets have all kinds of natural nautical designs with some fantastic sentiments. Speaking of sentiments, the font on this one is awesome, no? 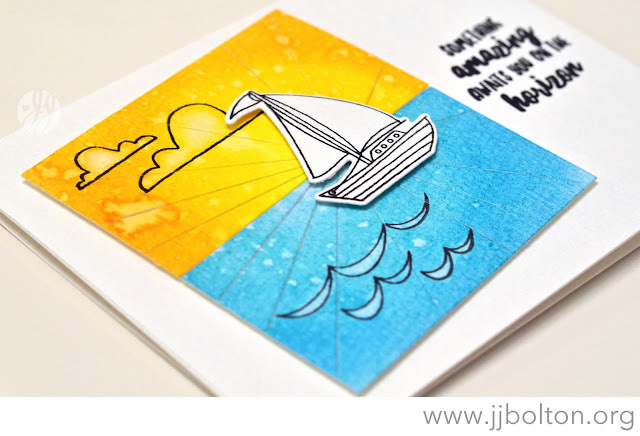 For this card, I created a little scene using the two sun ray panels of the Silver Linings die set. Together, they make a perfect full ray pattern. Essentials by Ellen brand stamp set (Maximum value $25 USD) currently in stock at Ellen Hutson.com To enter my giveaway, please leave a comment on today’s post by Tuesday, August 23rd! There is also a crazy good GRAND GIVEAWAY in the CLASSroom! To enter, be sure to leave a comment there, also by Tuesday, August 23rd. If you get lost along the hop, please visit the CLASSroom blog for a complete list of all the designers. Happy hoppin'! Now it's time to hop on over to Katie Brooks! I'm so excited to be debuting my Happy Home, Hanging Banners, and Falling Snow stamps and die designs for Avery Elle today! 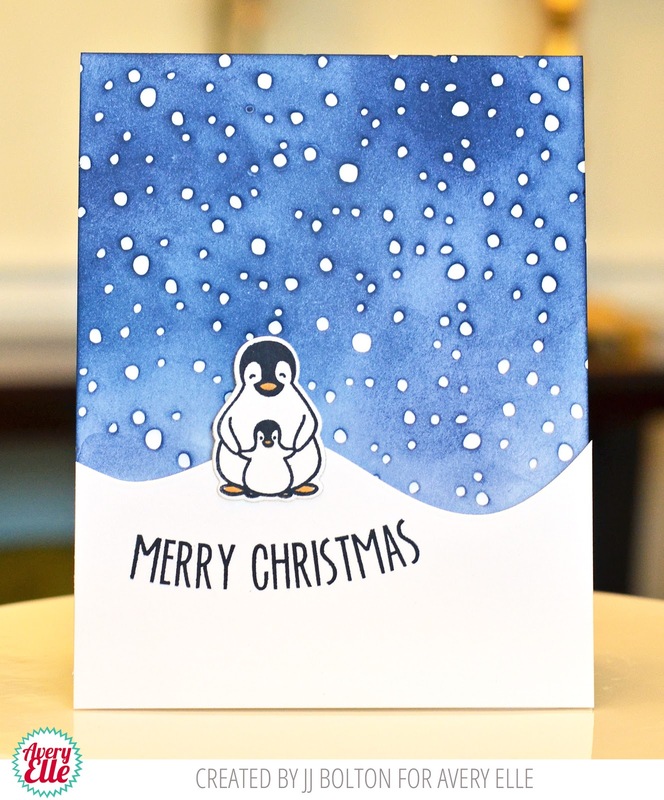 You know that I love a good "scene" card, and these new stamps and dies make it easy to create some homey and snowy scenes. 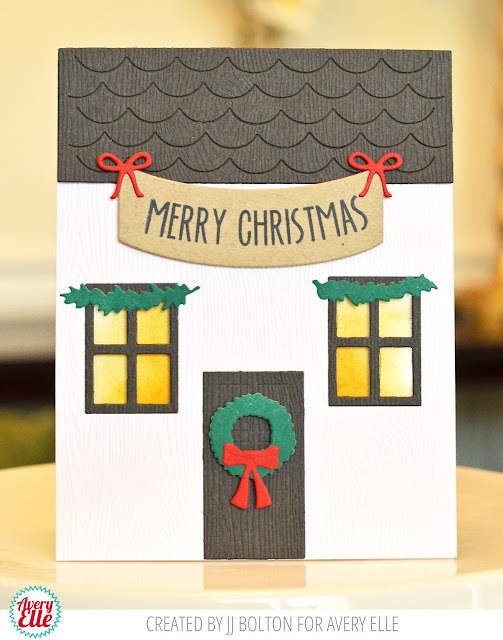 My first card combines the Happy Home die set (shown on the right above) with the Hanging Banners stamps and die sets (the two sets in the middle). 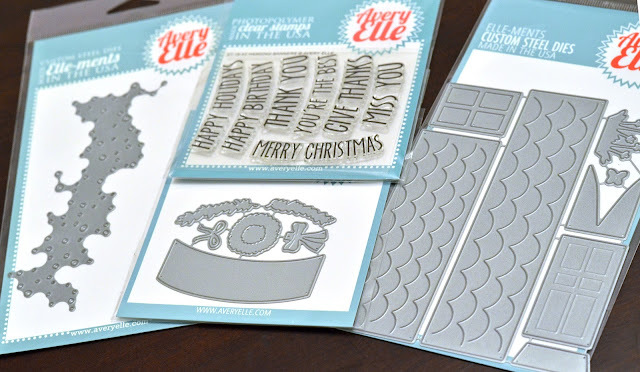 The Happy Home die set has everything you need to make a portrait or landscape A2 house card. When you have a full size design that covers the entire card face, it can be tricky to get a sentiment on there. 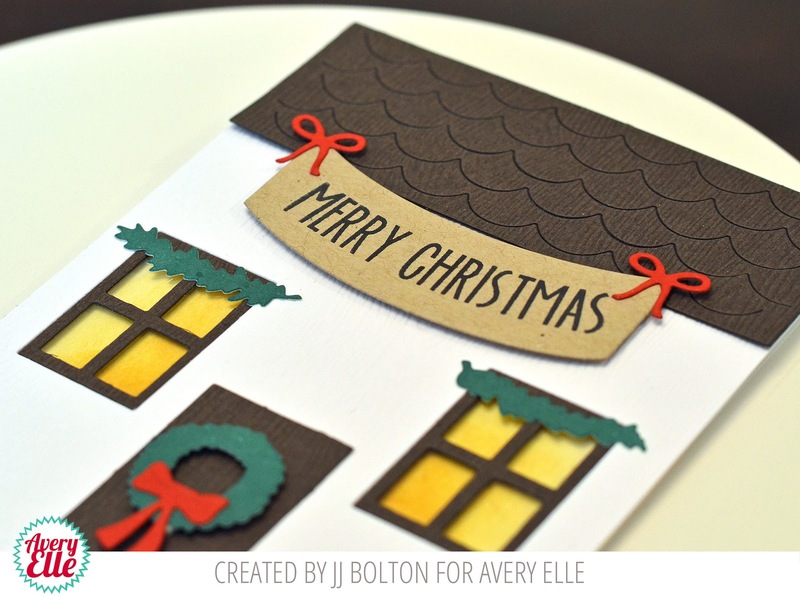 The Hanging Banners are a fun way to add the sentiment without covering the design of the card. The flowers are actually one piece that is colored with Copics. Because it's all one piece, they are much easier to attach behind the window boxes. The last new release I want to share with you is the Snow Die. 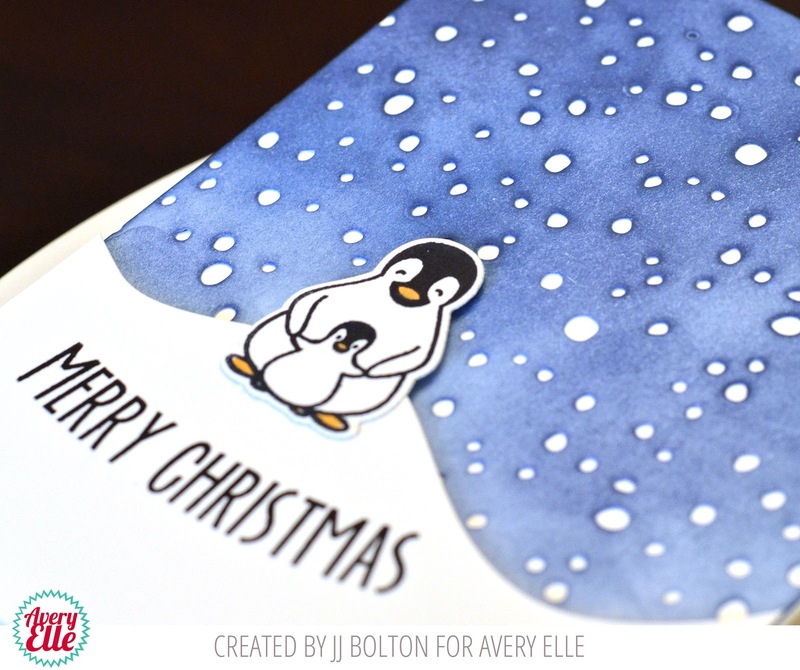 This die lets you create really snowy scenes with a natural-looking snow fall! The die is designed to be used multiple times to cover a bigger area. For this card, I die cut it 3 times to get this effect. Then I blended some dark blue inks over it and glued it to white card base. For the bottom I used the wavy die in the Custom Panels set to create a snow bank and added a Mama and Baby Penguin from the Penguin Greetings set. The sentiment is from the Hanging Banners stamp set which works even without the banner. Thanks so much for stopping by! The new release will be out August 11th, so keep an eye out at the Avery Elle site! Lots of other fun goodies!